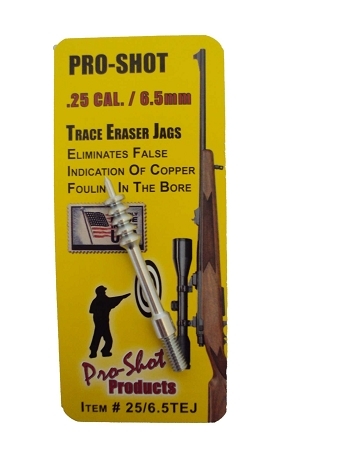 Pro-Shot's new Trace Eraser jags eliminate false indications of copper fouling left in the barrel caused by traditional brass jags. Aluminum Jag with special secondary coating treatment for added protection. •	Precision engineered Design and Function. •	Keeps patch in place while cleaning for maximum cleaning. •	Exact fit for each cal./mm. •	All rifle and pistol jags have #8/32 thread, expect .17 & .20 Cal. Which is #5-40 thread. Jags are stamped according to each size for identification.